Business travel is a mixed blessing, as although it beats spending your life working in the same factory or office, the reality is spending time in someone else’s factory or office, and not much time seeing the place where you are visiting. But there again, that’s what you are being paid to do, so any sight seeing time you get is a bonus, and a rare one at that. For my quarterly meeting in Switzerland we normally stay in a two horse town near the factory, but for some reason we ended up staying in Lucerne for the most recent meeting. 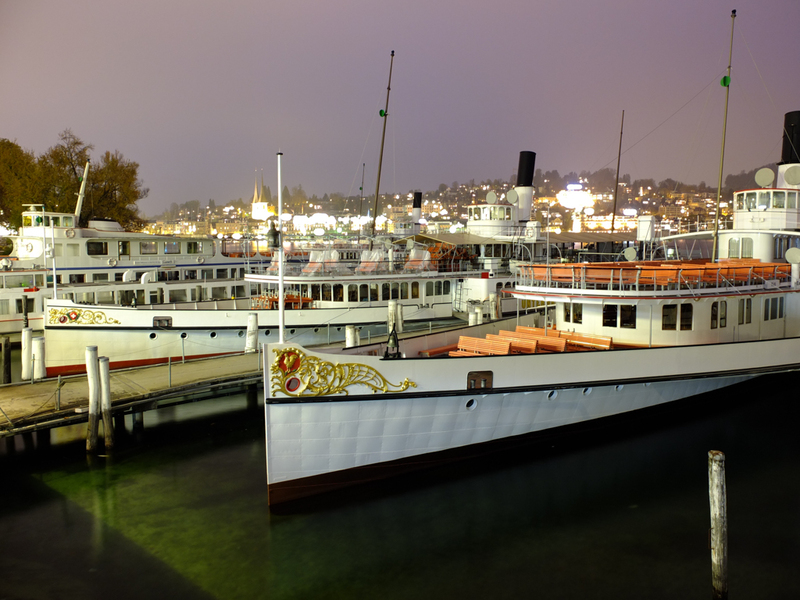 Arriving late at night meant that I wasn’t aware of the surrounding area but in the morning I was pleasantly surprised to find the Lucerne steamboat fleet anchored up for winter opposite the hotel. There is no quayside access, but a convenient high level walkway has been built which gives a good view of the fleet. The large green building in the top right of the picture above appear to be a giant covered dry dock and engineering workshops for the steamboat company, and the walkway hinges upwards when required so that ships can be dragged in for maintenance.